You know that dreadful folk song, “99 Bottles of Beer on the Wall”? If you replace “99” with “14” and “bottles of beer” with “glasses of wine” then you have my Tuesday evening. 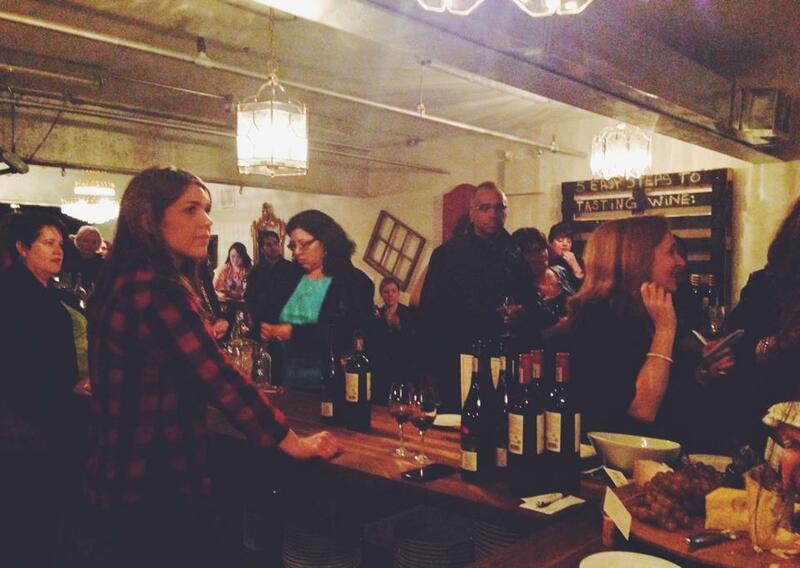 The iYellow Wine Club is a group based in Toronto that invites its members (and guests) to sample wines from all over the world, and meet and mingle with Toronto’s fellow winos. When I received an invite to attend their “South Africa Taste + Tweet”, I jumped at the chance to spend Earth Day 2014 learning about the growing sustainable wine industry. Hosted at the iYellow wine cave (243 Queen St. W) with an alleyway entrance, the event was hard to find but definitely worth the struggle. The moment I walked in the door, the coat in my hand was swapped with a glass of Pinot Grigio. Sweet to the taste, this was a great drink to start the night off with. Guests were given markers to label their glasses with in order to avoid confusion. Next up was a Nederburg Sauvignon Blanc. John McFarland recommended that guests pair this wine with a camembert cheese in order to balance the drink’s slight astringency, as this wine is less fruity than most being sampled. I decided to switch over to red at this point, and continued alternating back and forth throughout the night. Apparently this is a no-no — who knew? Ah well, a rookie mistake. 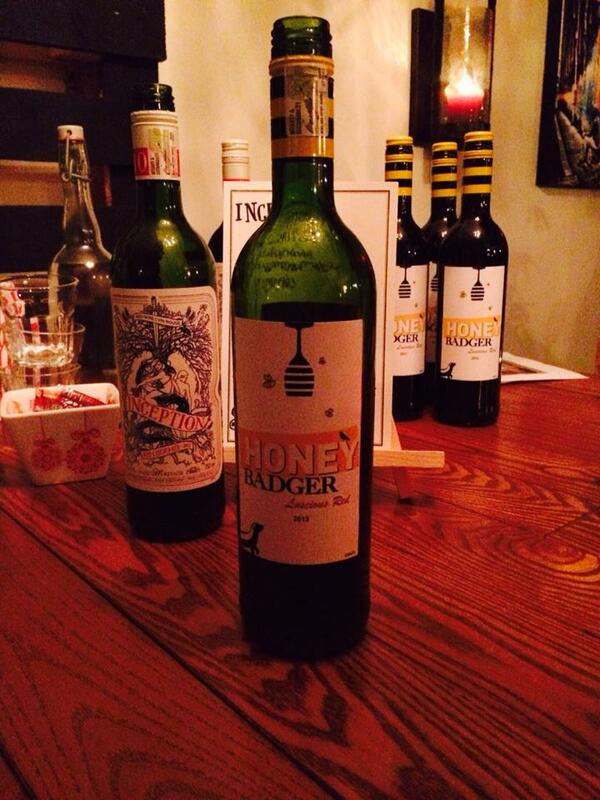 Next I sampled Honey Badger Sweet Red 2011, a 95% Shiraz and 5% Pinotage from Western Cape. This wine was by far the sweetest of the night. Perhaps a little too sweet for regular consumption, but perfect if having a small glass with dessert. 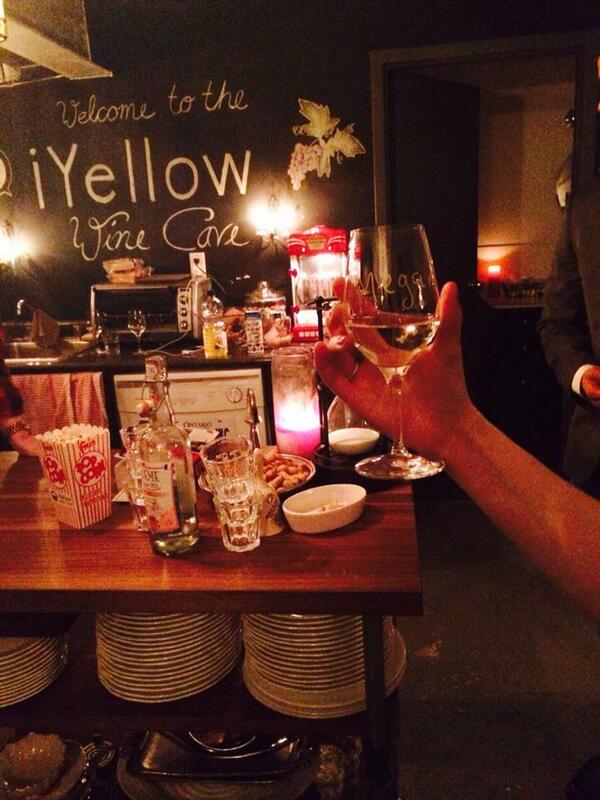 iYellow Wine Bar used the terms “approachable” and “picnic” to describe the new Inception Pinot Noir. My photographer/self-proclaimed wine connoisseur called this “the soda of wine” due to its easiness to drink and lack of aftertaste. A full-bodied beginner’s wine that should be monitored, due to its 13% alcohol content. About halfway through the evening, a short presentation was given by Oliver Kristen, founder of The Grape Grinder. Oliver described the importance of eco-friendly wine, explaining that Grinder’s goal is to make a better product while encroaching less on the environment — keeping their “ecological footprint” to a minimum. Oliver explained that most South African wines, including Grinder’s, are labelled with a sustainability seal that certifies the wine has been produced sustainably, can be traced back to its exact origin, and confirms that it was bottled in South Africa. Individual bottle seal numbers can be checked online at swsa.co.za. After trying the Grinder Pinotage, I tried another Pinotage made by Cafe Culture. Hints of a smokey mocha were tasted in this; definitely one of my favourites. I was told that it would be paired well with a smoked meat or a pasta dish. Of the Pinotage wines, Grinder tasted smoother and Cafe Culture felt a bit heavier. Next I tried a glass of Roodeberg red, the label describing it as a “classic blend of red varieties”. I found this wine to have a slightly lighter body than the other reds without losing that concentrated rich flavour. Seven glasses done, seven to go! If you’re wondering how I was even still vertical at this point, you’re not alone. Wine #8: The Pavillion Shiraz Cabernet Sauvignon 2012. iYellow Wine Club used the terms “mellow,” “easy,” and “mineral” to describe it. Fruity and flavourful, my photographer and I both agreed that its aftertaste was strong but sweet, similar in taste and consistency to Bellingham Big Oak Red 2012, which we tried next. At this point I switched back to white, opting for a glass of Durbanville Hills Sauvignon Blanc 2013. This was not only my personal favourite, but the most popular wine of the night for everybody! 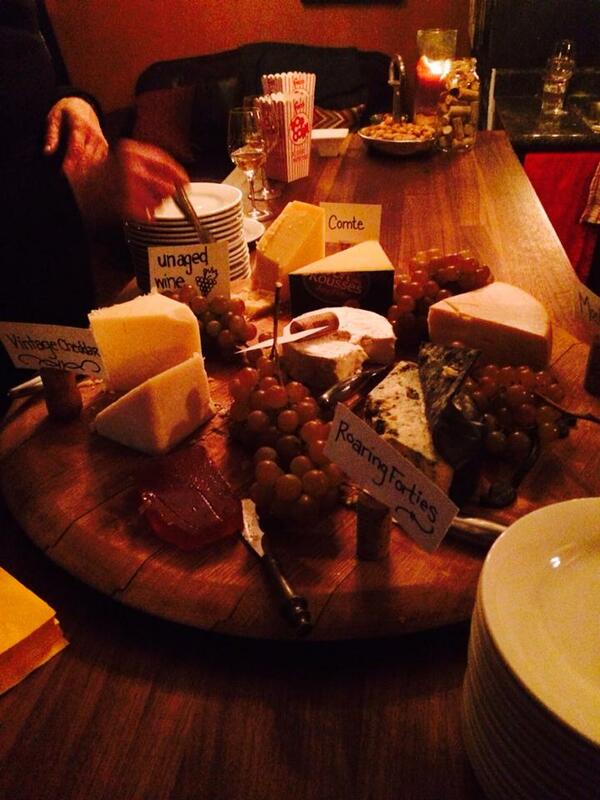 The aggressive taste was an overall crowd-pleaser, and I overheard guests describing the wine as “punchy”. Number 11: a glass of Bellingham The Bernard Series Old Vine Chenin Blanc 2012. This wine had a rather bitter taste. I enjoyed it, but its bold aftertaste was a bit too strong for my palette. 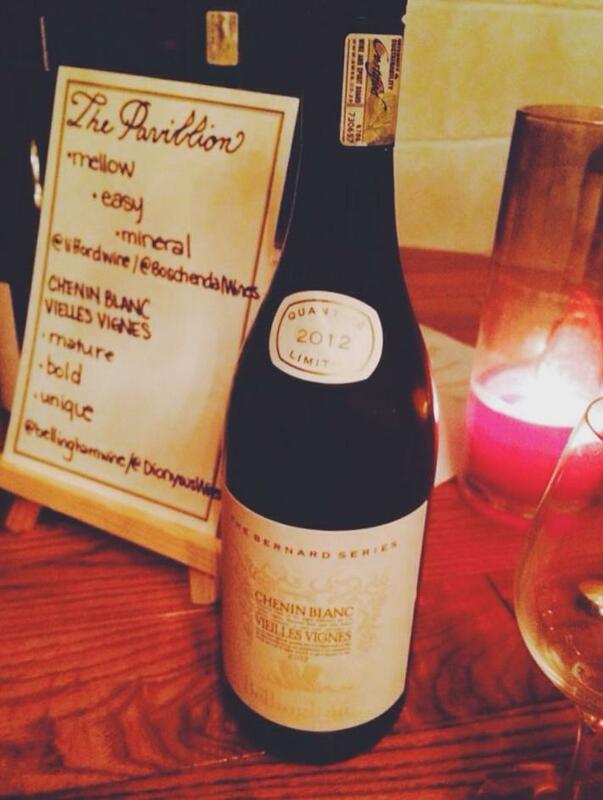 Number 12: A second variety from The Pavillion: a Chenin Blanc Viognier from 2013. An incredibly dry and crisp wine that I liked very much. At this point in the night, my handwriting had become increasingly problematic. In my scribbles about this wine, I can make out “smells floral and tastes carbonated, so it’s pretty great”. Trust my drunken hand. Number 13: A 2011 Shiraz also from Durbanville Hills. This wine had a definite earthy taste to it, brought out by a variety of spices. Number 14: Place in the Sun Shiraz 2012. The sweet spiciness of this wine made me want to turn it into sangria and serve it alongside heaps of guacamole to all my friends. Overall, this was a great night! I loved having the opportunity to learn more about the sustainable wine movement. 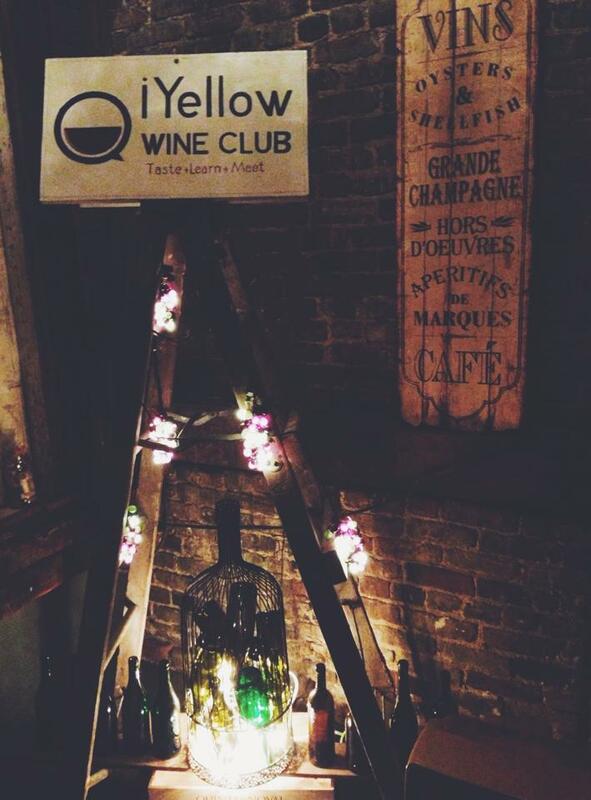 To keep up to date with iYellow Wine Club’s future events, go “like” them on Facebook. Interested in seeing more from the night? Check out anything my fellow guests might have posted while live tweeting with the hashtag #ILoveSAWine. 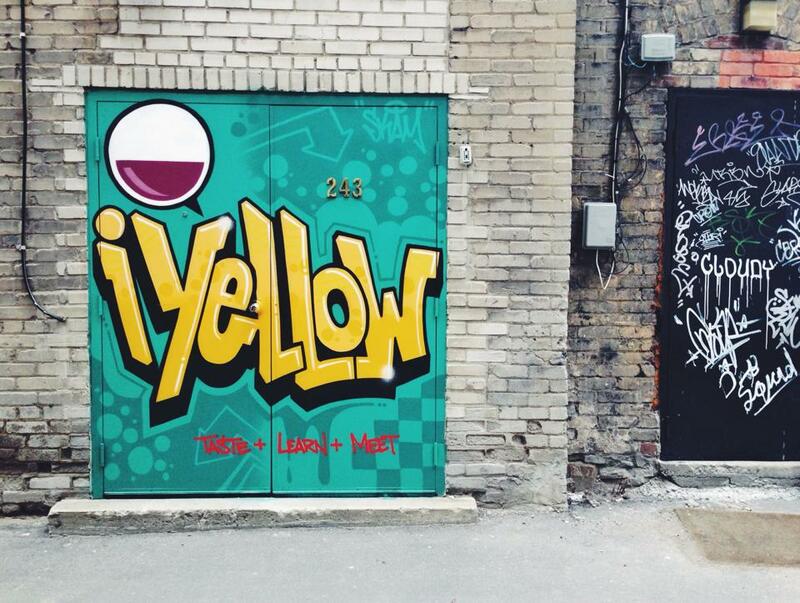 It’s not hard to miss the bright yellow doors of Weslodge on King Street West with the flashy signage. I’ve always wondered what was inside those doors but never experienced it for myself. Thankfully just the other week, I was invited to the saloon inspired restaurant to experience the launch of their meat board aptly titled, The Cutting Board. 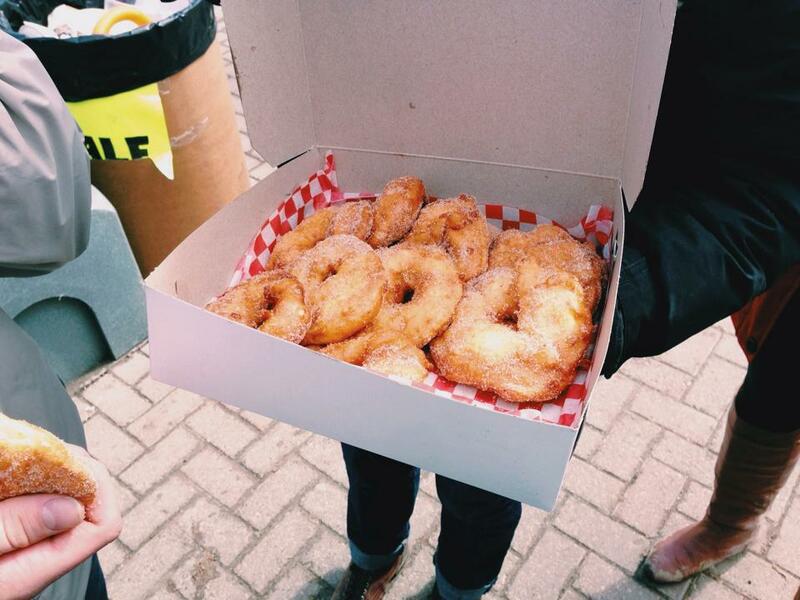 Toronto seems to be all about shareable plates right now and well, sharing is caring. The Cutting Board consists of an impression selection of meats on meats on meats which include hen, beef, pork, lamb, and poultry. Each have been aged, smoked, marinated or slow-roasted to perfection. The Cutting Board has some definite hits and some misses (for sure). For starters, the hen is sous vide before being breaded and deep-fried, which makes it just crazy good. The 32-day aged ribeye? 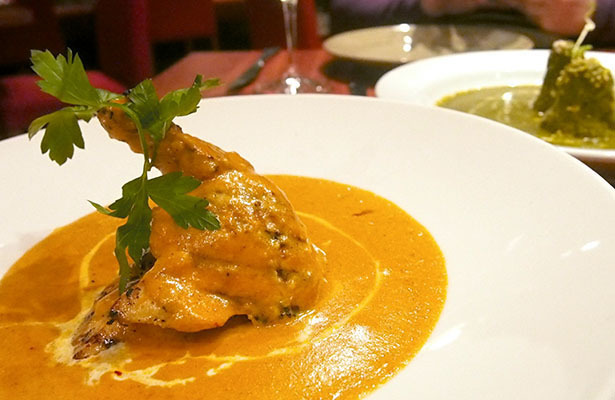 So tender that you’ll never want anything else ever again. But the lamb ribs? Such a miss as they were so dry and tough. Does it stack up to some of the other BBQ places in the city? Absolutely, especially for the price that you’re paying. It also just depends on the type of BBQ you are looking for and the amount of meat you are looking for (example: do you want a full dish for yourself or are you into sharing). In my opinion, the Cutting Board offered more than enough food. For example, my dining partner and myself that evening didn’t finish off our portions and we were plated what would have been given to 2-people. Available on Sunday and Mondays from 5pm onwards at $29 per person, enjoy the Cutting Board at Weslodge now. I was recently invited to spend a weekend at the farm where my best friend grew up in Elmira, Ontario. Visiting a town with a whopping population of 9,931, you’d expect a relaxing and quiet weekend in the country, no? Well, it certainly started off that way: I spent Friday evening playing with the family’s seven household pets and watching Come Dine With Me reruns. 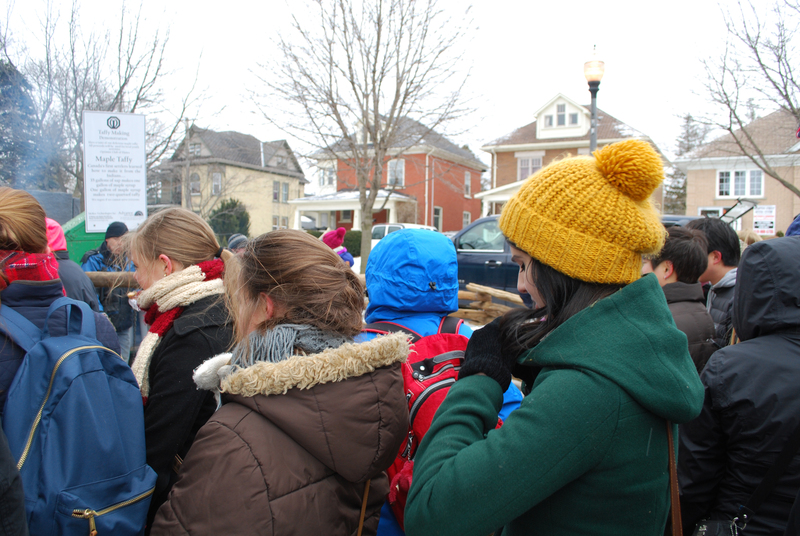 The next morning, I dragged myself out of bed at 7am and then walked around outside in the cold for the next 10 hours. And I had the best time. 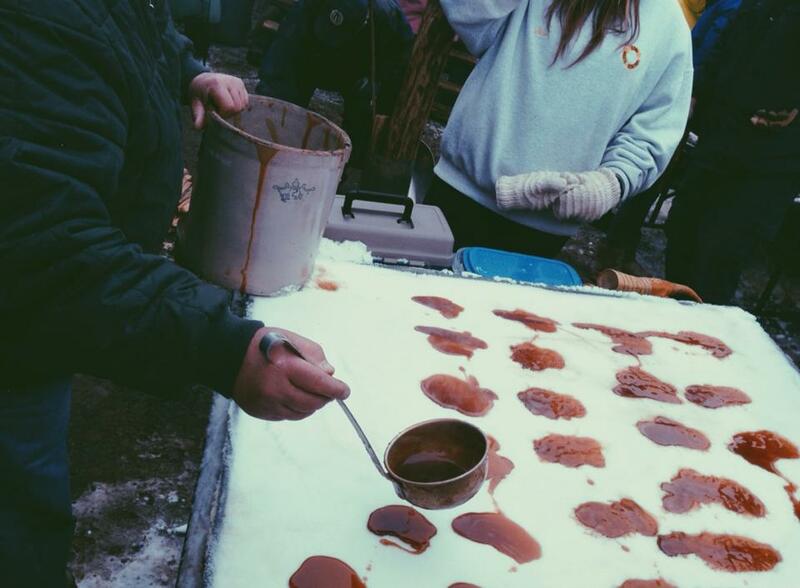 The Elmira Maple Syrup Festival has been an annual event for the past 50 years. 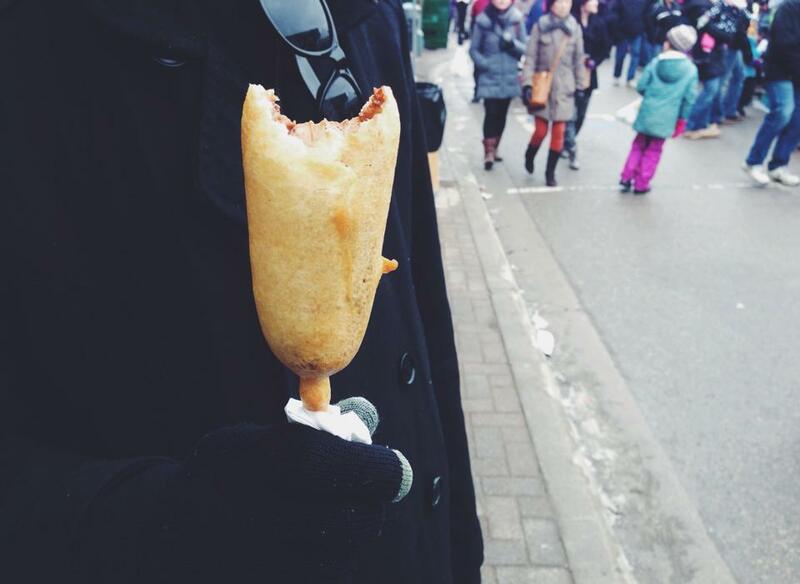 The main attraction is, of course, the maple syrup and related food vendors. 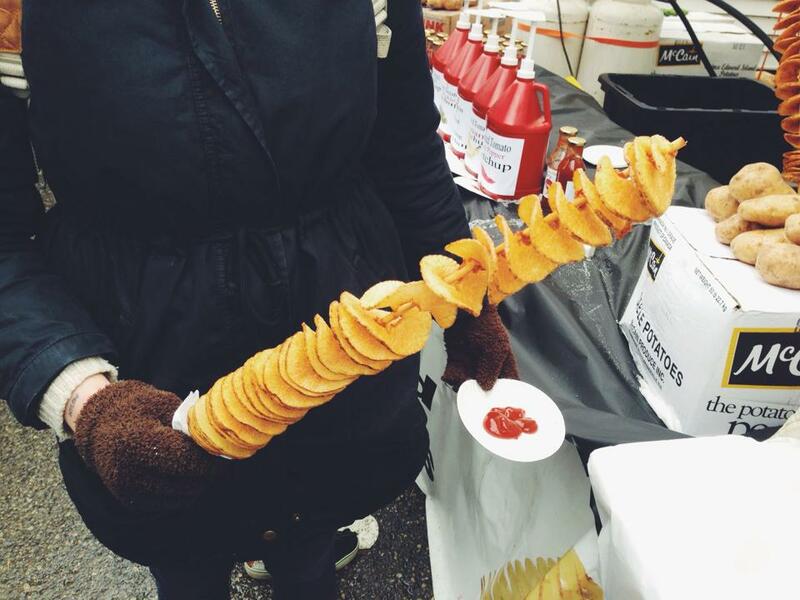 The event attracts 60,000 people every year, and most can be seen walking around, munching a lamb’s leg, a stack of pancakes or something deep-fried. Oh, the maple syrup! It was heavenly. There was maple syrup on everything: maple lattes, maple taffy, maple kettle corn, maple syrup baked beans, maple syrup candies, and Beaver Tails with maple butter. I didn’t want to slip into a sugar coma, so I decided to limit my syrup intake. Well, I tried. First, I decided to sink my teeth into some maple taffy. 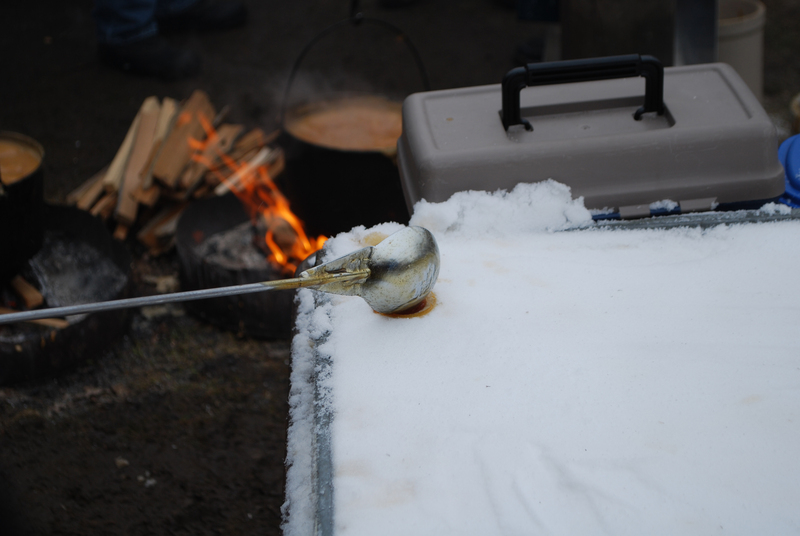 Maple taffy is made by boiling maple sap over a fire until it turns into maple syrup and then continuing to boil it until it becomes thicker. It is then poured onto snow and picked up with a stick, once partially cooled, and then served. I had to wait a solid 45 minutes for one small piece, but it was worth it to get such a decadent start to the morning. 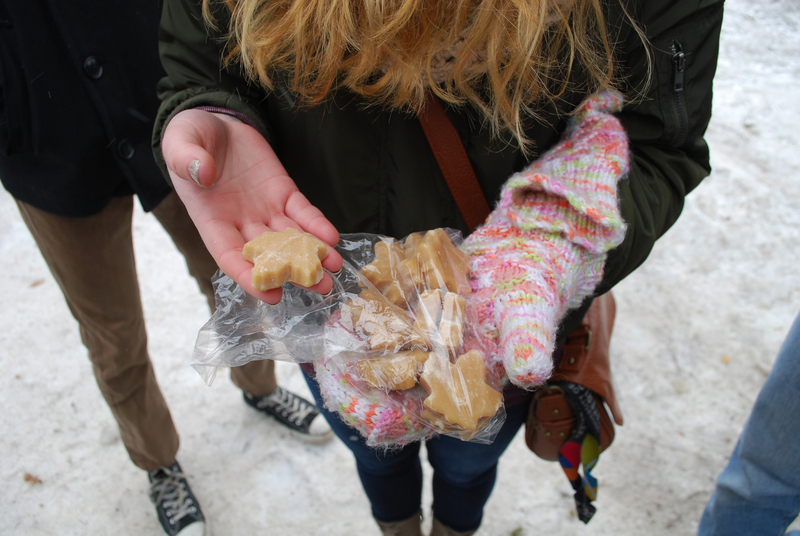 Next, I tried maple sugar. By “tried” I mean I sampled a small piece for free and then proceeded to buy 12 more. 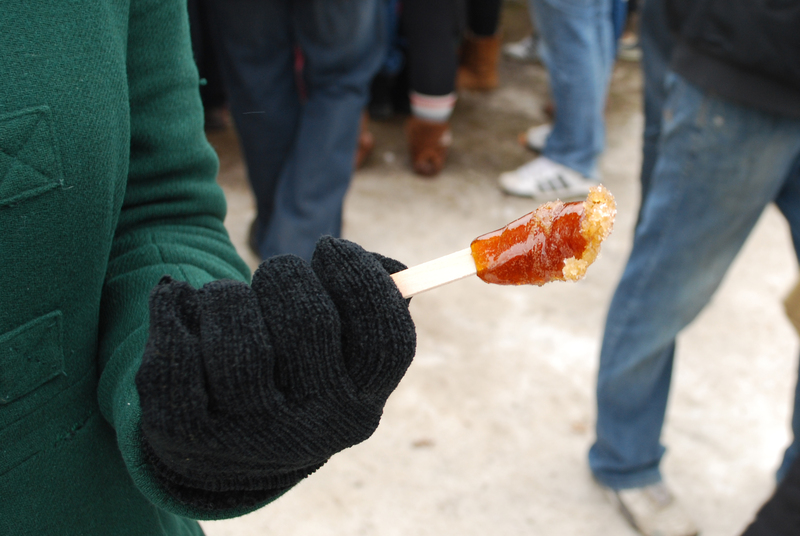 Maple sugar is prepared much like maple taffy, but is boiled for much longer until it solidifies. These soft and sweet candies were sold by countless vendors all over the festival, but I bought mine from a small table run by local Mennonites on the outskirts of town in front of a McDonald’s for 25 cents a piece. I also bought a few small tubs of pure maple syrup to take home for loved ones. By midday, my friends were getting hungry so we decided to venture away from the festival for a bit in an attempt to get a healthier lunch. Luckily for us, there were tractor-pulled wagon rides available: the town’s adorable version of a free shuttle bus. This was the first — and probably last — time I rode to a fast-food restaurant sitting on a bail of hay, sandwiched in between two teenage girls in bonnets. The festival really is an event for both the locals and the tourists. Overall, it was an incredibly fun, family-friendly day. Sometimes I forget how Canadian I am — and then I go to something like this and have a blast. To keep updated on next year’s festival, “Like” their official page on Facebook here. A few weeks ago, I had the pleasure of getting an insider look at the innovative things PayPal is doing with mobile wallets. A “happy hour,” of sorts, was held at Boehmer in Toronto and this intimate event really opened my eyes to the future of mobile payments. Paypal has partnered with TouchBistro (which is the neat system that many of my favourite local spots have started using in lieu of traditional Point of Sale systems) to enable diners to check in and PayPal-it. It means you can simply walk into your local bar/coffee shop, order, and not have to fumble for cash or a card. It’s an almost seamless way to pay, and be on your way. This also means that if you are like me and have a limited amount of time for lunch, you don’t have to wait for your bill when dining in. It even allows you to split checks and be on your merry way in no time. It was an absolute treat to be able to combine two of my interests: really good food and really cool technology. The Paypal app is accepted at more than 50 locations in Toronto and will be rolling out everywhere soon. Thanks to the team at Paypal and Edelman for having me. Probably the best fried chicken I’ve ever eaten. Last year I went to an event called Art Of The Cocktail that was put on by Toronto Life, it featured five cocktail stations and food pairings. Not every cocktail was great but I kept drinking the few I did like and got so tipsy I even ate non-kosher meat; I continue to only bring shame to my family name. 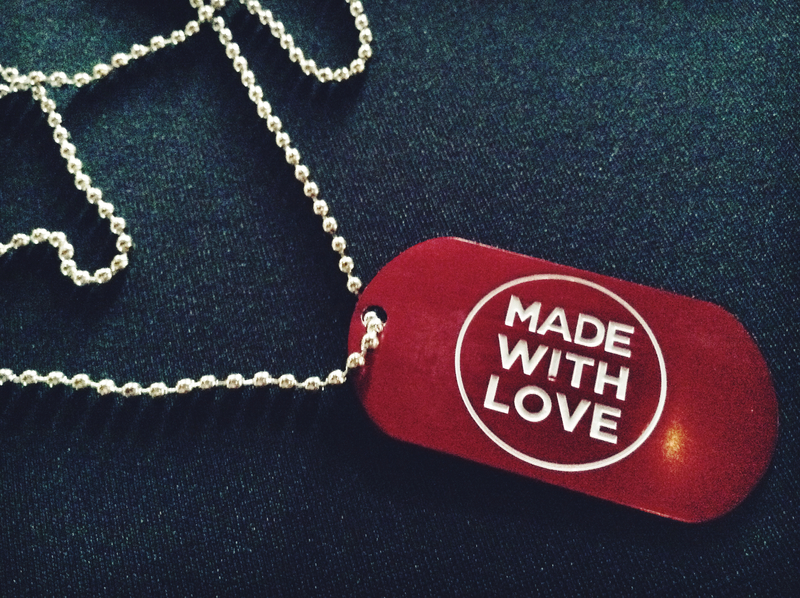 Made With Love is a North American cocktail competition; two winners would be picked from the Toronto competition to head to the finals in Montreal. Most of this review is written Memento style. I took a lot of photos to help me remember. While I went home in fine mind, I woke up hung over, and in the evening I had huge red circles under my eyes. But that’s what I get for drinking 17 cocktails. Yes, 17 cocktails, it’s no urban myth; it’s a true story that happened to me. So let me regale you with tales of the night I drank 17 cocktails so that one day you may tell your children and they will tell theirs. Let me start of by saying that I did not have a great strategy, we got there early before the food was served and drank fast and loose. Always have a strategy and always stick to the game plan. 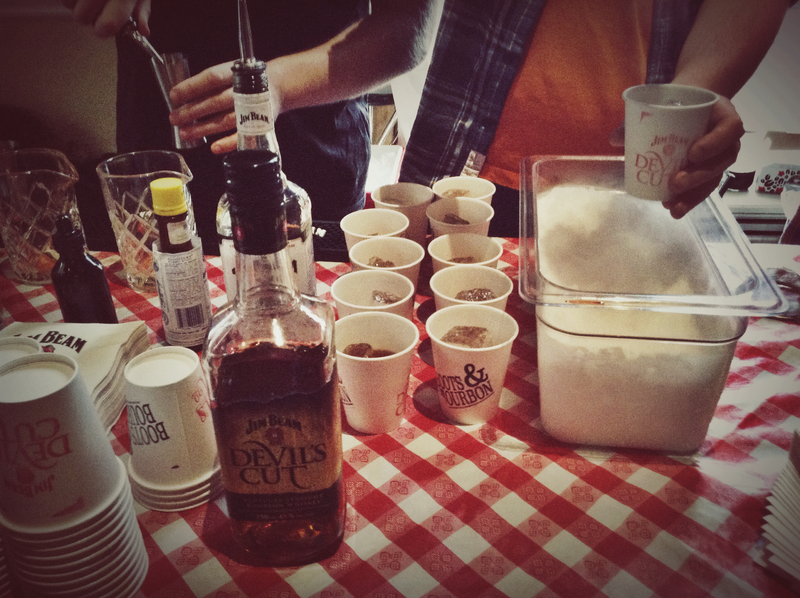 The first competitor that caught my eye was Adrian Stein from Boots & Bourbon with their Coffee & Donuts. At the end of the day while more sophisticated and creative cocktails won my heart I did think this was a very cleverly executed concept. 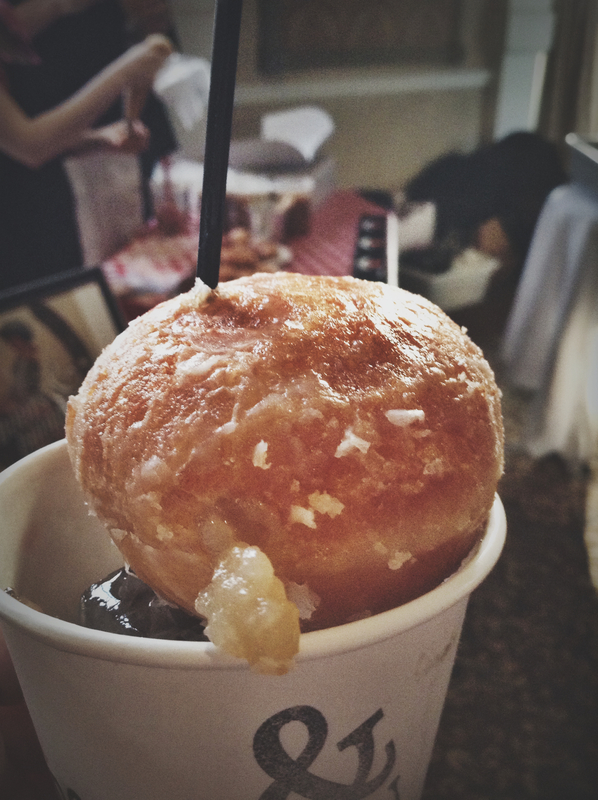 Jim Beam Devil’s Cut Rum infused with cocoa bean/cinnamon with a donut infused with the very same. Next my pal suggested we check out The Geraldine and spoiler alert, this is who both of us gave our dog tags (each person was given a dog tag to give their fave) to. 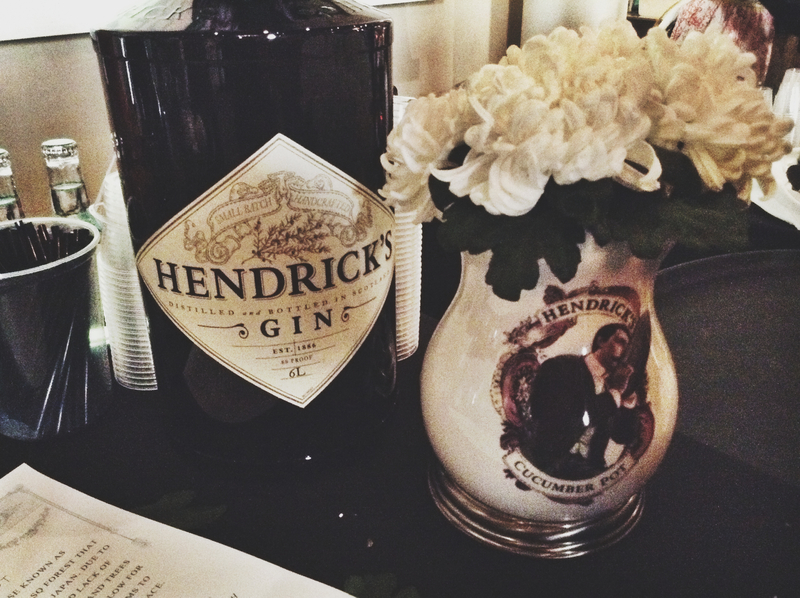 Geraldine had a pretty table, high concept, fantastic tasting drank and a bartender with a great moustache / tie combo. The drink was called The Sea Of Trees; the concept was to take the drinker on a tasting journey back to AOKIGAHARA, a forest in Japan. 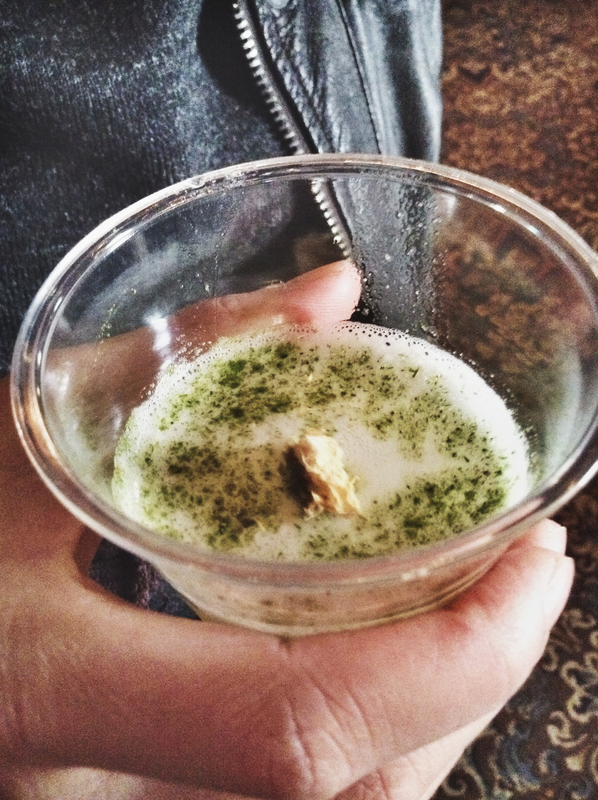 The drink had, along with mushrooms and fennel, cedar dust. It really was a perfect drink. Some other choice drinks included Jamaican Trade by Home Of The Brave, another boozey coffee that did it better than Boots & Bourbon’s offering. Points to their bartender for sporting a great pointy villain moustache. Fonda Lola had a light summer time drink with their Campari Sunrise; Whippoorwill Restaurant (which may or may not take their name from a Magnolia Electric Co. song, once can only hope) had a Dark Horse rye paired with candied gingers and the ever exclusive Toronto Temperance Society had a black pepper infused gin (this was the last drink of the night, it was so strong I took one sip, I regret not being able to drink the whole thing). Two Black Sheep had a rhum drink that used a gadget to smoke hickory; unfortunately it kind of ended up tasting like burnt marshmallows. But the low point of the night was for sure Marche with their Three Course Cocktail. Real Talk: it’s the Marche. When I got to the point that I couldn’t stand up straight anymore, we hovered around the kitchen doors: mini Rueben sliders, fancy fries, veg tacos, it was a plenty delicious spread. Every time the doors swung open it was like what I imagine Christmas morning to feel like. If you spent every Christmas morning pretty wasted. The winner of the event was announced past 10 P.M. with the People’s Choice award going to the much-deserved Michael Mooney of Geraldine and the Judges Choice going to Jay Meyers of Hudson Kitchen. When I hear the word ‘gastropub’ the immediate thought that comes to mind is comfort. 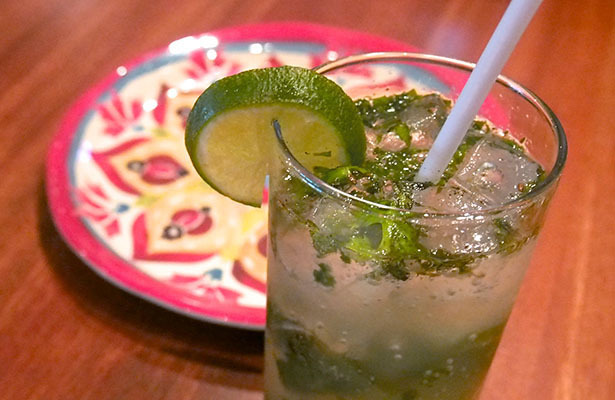 Thankfully, Habits Gastropub (928 College Street) serves up just that and more. 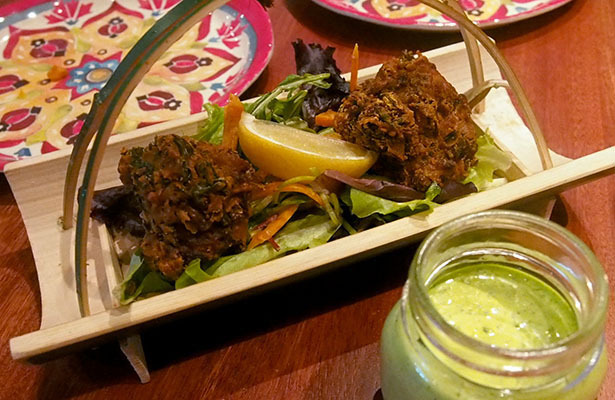 Owners Michelle Genttner and Luis Martins have taken every consideration into heart since opening up their establishment (in 2012) to ensure not only did they serve quality food but they provided a warm, homey atmosphere. The interior features beautiful exposed brick, reclaimed and refinished wood tables and warm lighting. The bar is stocked (to date, Habits has 300 bottles of whiskey, giving it the third largest collection in Toronto) with some of Toronto’s finest craft brews and wines. Each week, several different events and live performances take place – so depending on the evening, you and your friends could enjoy something new. So how does the food at Habits stack up? Well the best way to describe everything here is high-end pub fare and for that, it is impressive. 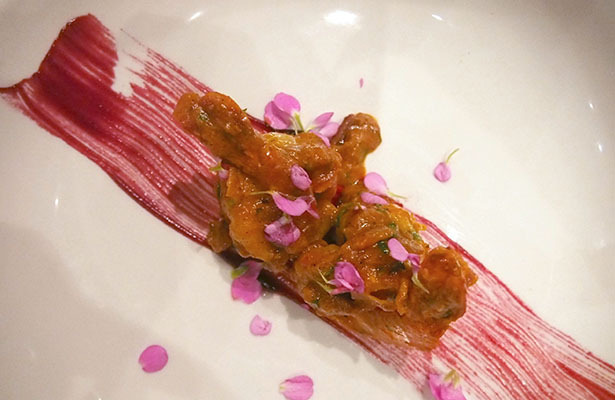 We started off our evening with some Buffalo Sweetbreads with homemade blue cheese & spicy BBQ dipping sauce. This little gem of a nugget was tender and delicious. 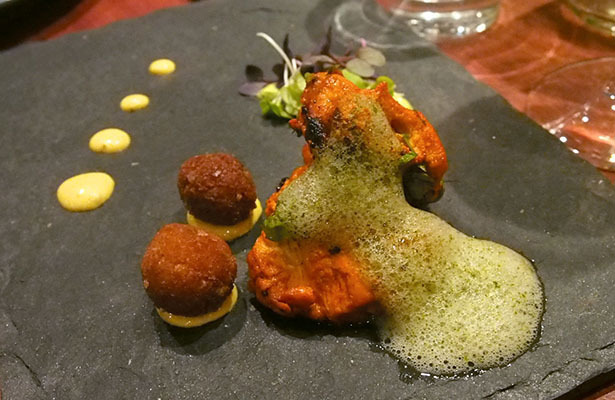 I’m a huge fan of sweetbreads and found it perfectly cooked. Paired up with the blue cheese sauce, it was fantastic. Next up we were treated to another high-end comfort food of their Salmon Duo (Cured Salmon & Pate) with Homemade Mustard and Pickles. It was simple and properly executed with all the richness of the salmon marrying well with the saltiness of the grainy mustard. Also: a beautifully plated dish. As mentioned, a huge trend that I’m seeing at a lot of Toronto restaurants right now is Cauliflower. To be honest, I am not complaining one bit. Habits introduced me to their Cauliflower salad marinated in anchovies and chili. It was probably one of my favourite dishes of the evening: perfectly sized florets and outstanding tastes. Just the right amount of heat. Another thing I’ve been treated to a lot lately is Bone Marrow and sure enough, Habits has it on their menu as well. What I can say is this: Habits does it well and just a bit different. The dish we had this eve was Bone Marrow on Toast with a Cucumber and Radish Salad. It was so rich and delicious with the salad atop giving it an extra crunch and feel. This was probably my favourite dish of the evening. We were then treated to Chicken Livers and Sage Pappardelle which was absolutely divine. All the pastas are made in-house (which comes through) and the dish was rich. You cannot go to any restaurant in the city without having a good ol’ fashioned Slider. The Habits slider was mouth-watering. A huge ol’ slice of bacon atop that mini-patty with a Putanesca relish, crispy onions and a toasted brioche bun. Come to mama. Habits Gastropub had everything that eve that one would want in a high-quality pub with high-quality pub-grub. 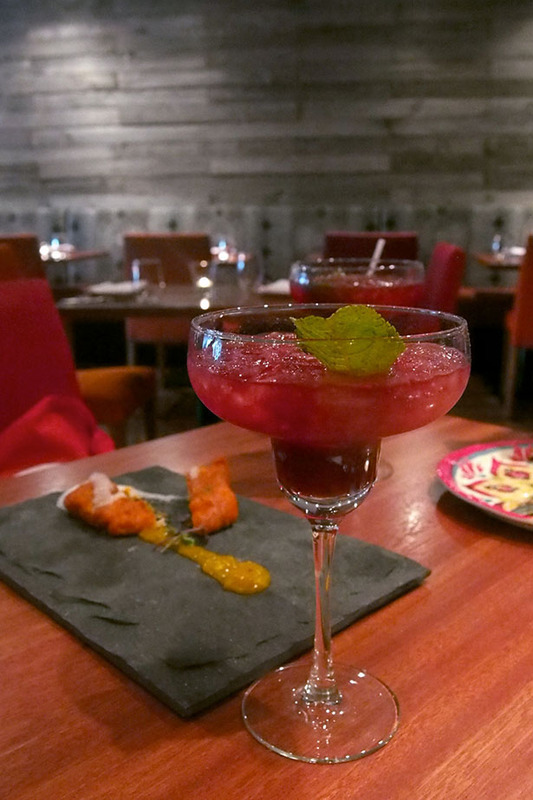 If you’re looking for somewhere to watch the game or have a casual and relaxed date night while also indulging in your finer dining side, then Habits Gastropub is the next hidden gem you should visit. 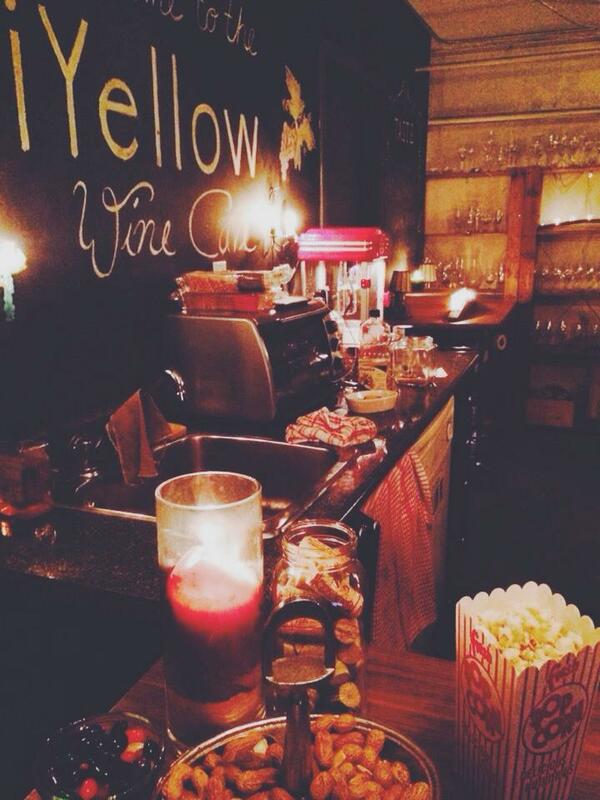 A new speakeasy has opened up on Dundas West and let me just say this: it is pretty legit. Say hello to The Libertine (1307 Dundas St. West). You wouldn’t know that it was there, as the door is unmarked. But there is one blinking tarot reader sign that glows in the distance, lighting your way. As you carefully navigate down the stairs to your unmarked destiny, glamour and opulence awaits. A long wooden bar lines one of the walls which gives way to many of their spirits and liberations. 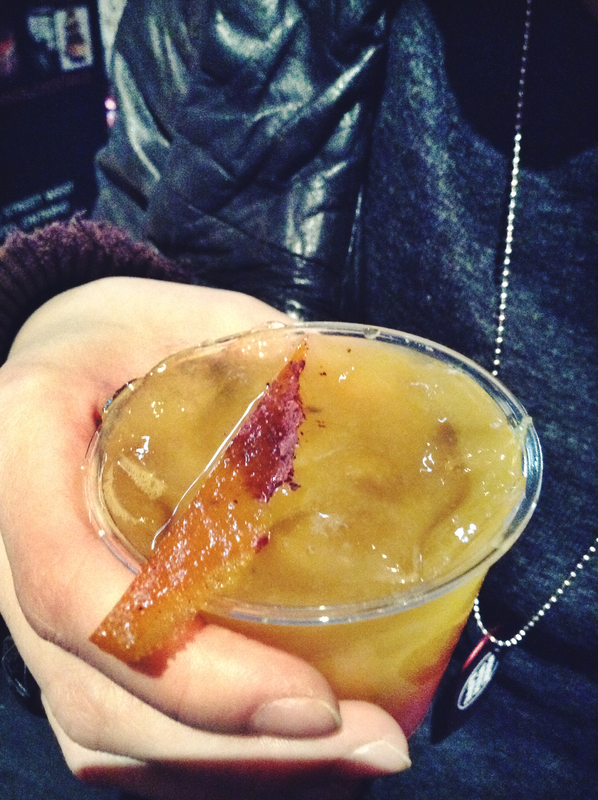 The drinks are unusual and quirky, like the Smoke n’ Mirrors – a spicy drink with bacon marmalade, basil, and ginger. ($12). 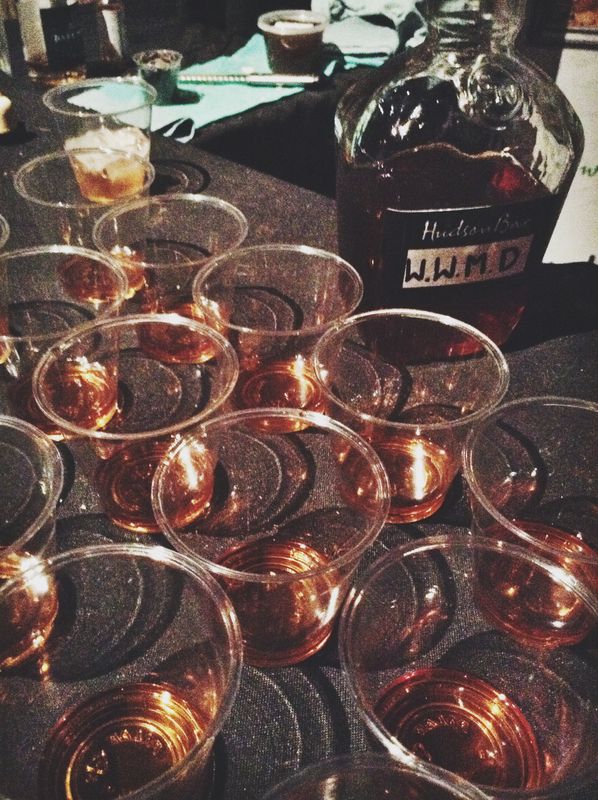 They have many other drinks which usually come in at this price-point & usually at a generous pour (2.5 ounces). But the bar list changes with the experimentation for the bar keeps and with the seasons. So be prepared for some lovely cocktails. The decor features high counter tops and crescent shaped banquets, upholstered in leather, adding to the witchy vibe. The tarot card reader is available five nights a week between 9 and midnight and charges approximately $25 a pop to see into your future. In the kitchen chef Jordana Schuetze has assembled a “small plates” format menu (ranging from 10 dishes, but changes regularly) which is heavily Asian inspired. 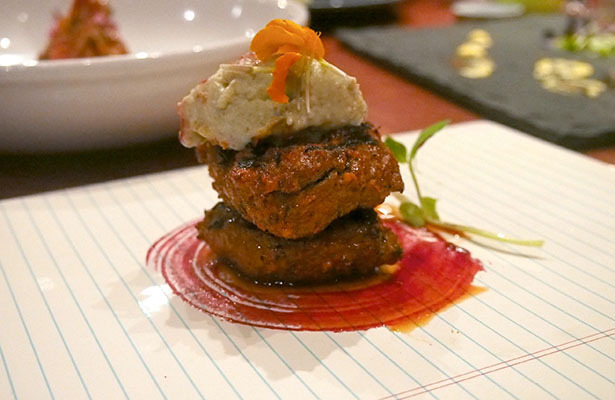 The menu changes depending on ingredient availability, but generally offers a fair number of vegetarian options. We begin our journey with the Korean Short Ribs, which one you dig in, you just can’t stop. The sweet and tender meat coupled with the sauce. Absolutely heavenly. This is a dish that I could eat all night without hesitation. Next up, we launched into their version of Deviled Eggs, which seems to be a big trend in Toronto right now. All pickled everything. This made for a quick and easy bite. It had a bit of crunch to it with some chip added to the top. It could compete with your Grandma’s Deviled Egg, that’s for sure. We launched into some beautiful and perfectly made Calamari and Shrimp dish, which was succulent and balanced. Everything tasted fresh and with their perfect grill marks, cooked to perfection. Nothing could be better than well-done seafood and this was just right. As mentioned, The Libertine has an extensive vegetarian offering including this amazing fried tofu dish. Delicate pieces of tofu deep-friedn and combined in a dashi broth with some aromatic shallots. Throw in some cauliflower and nori strips and you’ve got yourself a winning dish on your hands. I have been on a big tofu kick lately and this dish hit the spot in a big way. 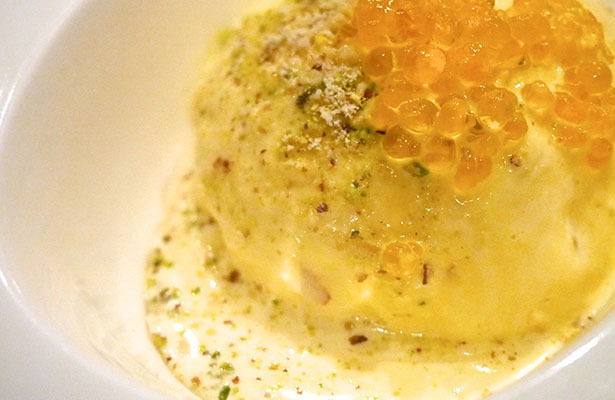 Finally, we’re told that Libertine offers one dessert nightly – so prepare yourselves for a surprise. This evening, we were treated to a deconstructed Pomegranate cheesecake. As someone who is not much of a sweets person, this was everything my heart wanted and more. 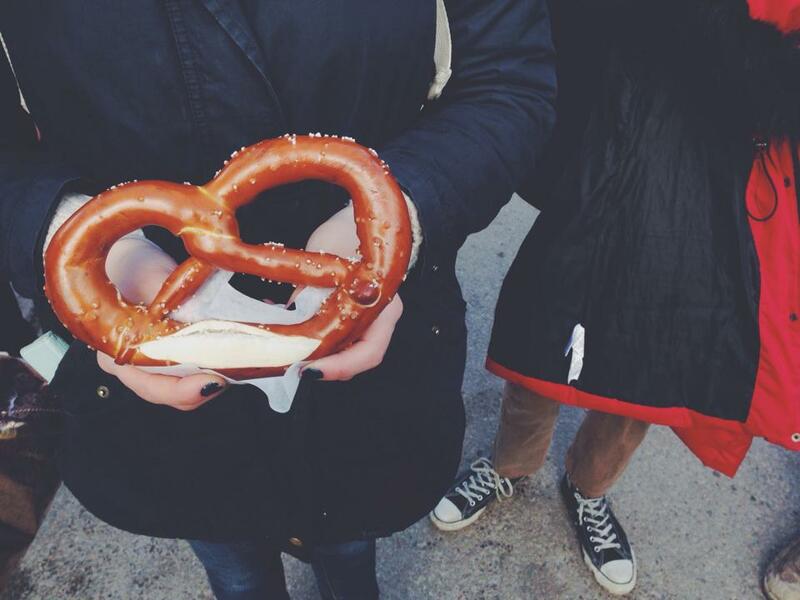 Just a bit tangy, a bit sweet and with a slight crunch. Yum. The Libertine has nightly events and just recently launched into a brunch service, which has hosted the Great Canadian Burlesque team and Fat Girl Food Squad. For more information on their menu and updated events, check their Facebook page.